A very strong earthquake has struck in Nepal with a magnitude of 7.9 (initial reports listed 7.5). One would expect that serious damage will result; three earthquakes in the last 110 years have approached this size, and the death toll for all three was in the tens of thousands (1934 M8.1 Bihar, 1905 M7.5 Kangra, and 2005 M7.6 Kashmir earthquakes). Although the data is preliminary, the depth listed at this point is worrisome, only 12 kilometers. Such shallow quakes are the most dangerous kind. A magnitude 6.6 aftershock has been reported. The earthquakes in this region are caused by the convergence of the Indian landmass with the Asian continent. India is being forced under Nepal and China, and the resulting thickening of the crust has lifted the Himalaya to form the highest mountain range on the planet. For the most up to date information, consult the event page at the U.S. Geological Survey. 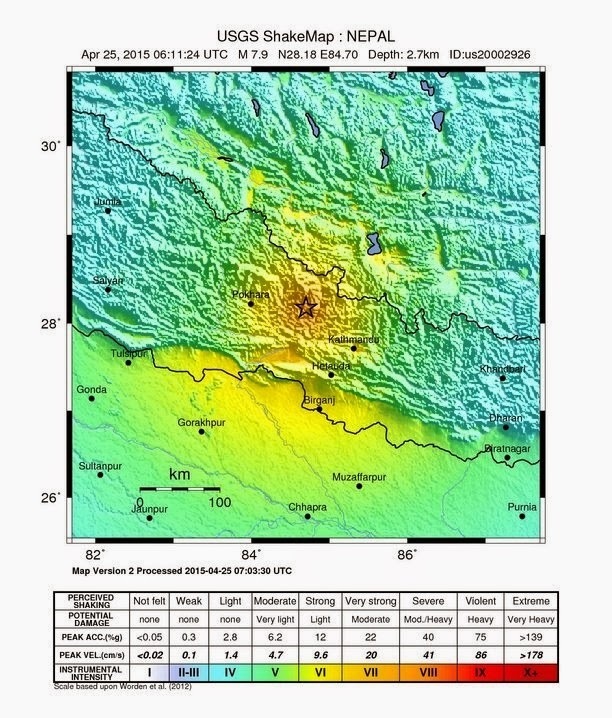 Moment by moment blogging on the quake can be seen at http://earthquake-report.com/2015/04/25/massive-earthquake-nepal-on-april-25-2015/. Update, 9:30 AM PST: More than a thousand people reported dead, but many more are missing. At least 10 climbers and sherpas are dead on Mt. Everest, due to an avalanche. It's been a bad year on Everest, as an avalanche took 16 lives about a year ago. The latest consensus of the magnitude places it at 7.8. Magnitude is measured in several different ways (Richter, or Local magnitude is not a useful method for quakes larger than magnitude 6.5), and early instrumental calculations are often revised as more data is collected. What predictions can we make as to what will happen next geologically speaking? Earthquakes are going to take place, volcanoes are going to erupt, and we won't be able to predict all that many of them. Especially the earthquakes, except for those in Oklahoma and other fracking states. Those earthquakes will occur almost like clockwork.